I love desi ethnic fashion and Bollywoods style diva Sonam kapoors ethnic looks are something I always look forward to. The fashion queen really slays it in both her western and ethnic looks but I love her traditional or fusion looks a wee bit more . Saree, lehenga or even a kurti, Sonam always manages to style them with a new twist sparking off trends and giving us new ethnic fashion goals in the process. Sonam loves wearing sarees and she constantly keeps styling them in new fabulous ways. I love how Sonam Kapoor actually walked red carpet of Cannes in Anamika Khanna sari in 2014, she is definitely giving exposure to Indian fashion. Most Indians dont prefer white for festive occasions but the trend is soon changing and you spot many women in whites even at weddings. 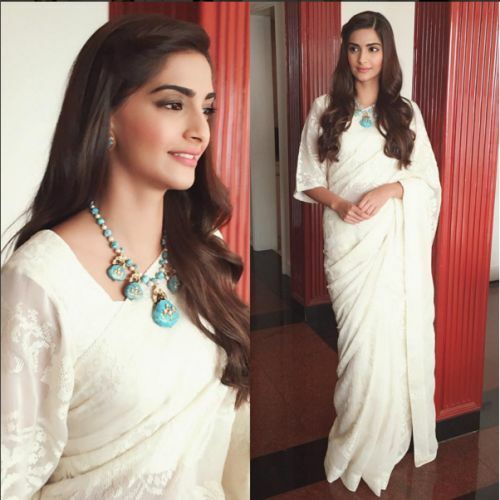 Sonam kapoor shows us how to wear white saree with a white blouse by adding a pop of colour with neckpiece. Soft make up and side parted open hair make this look a winner. Trust sonam to get quirky saree look right. She paired a funky lipstick printed Masaba saree with a fun peter pan collar blouse. 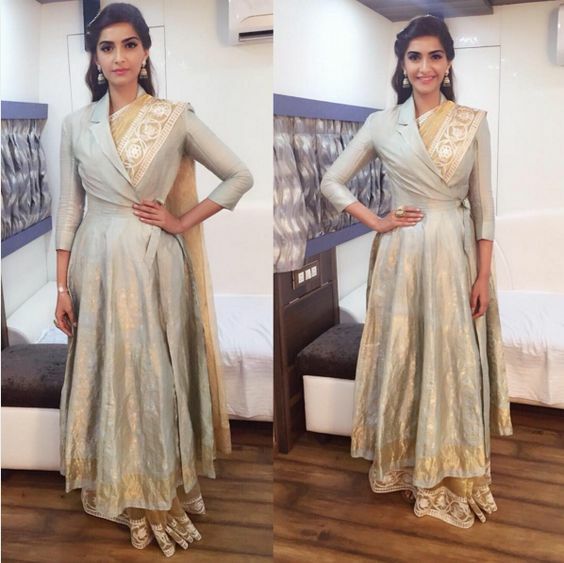 To keep all attention on the sari and blouse sonam kept accesories minimal and opted for a tight bun. Rose motifs on this masaba saree gave vintage feel and I love the hair do here. The red lips and flushed cheeks and elbow length blouse also add to the old world glam. 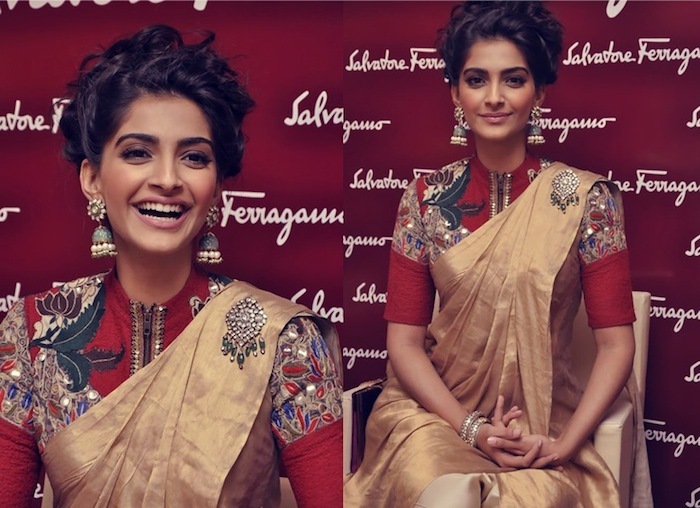 In a pinned up neat Anavila saree look sonam looked gorgeous . I love how she pairs this ivory white cotton saree with a printed blouse and potli. Sonam looked amazing in a grey and orange Manish Arora saree.  Adding more colour to her look was the green high neck blouse. I love how sonam styles plain sarees giving them a nice hatke twist . This plain biege saree is paired with an embroidered red blouse having a zip in front. The addition of brooch and the different saree drape makes thing more interesting. Sonam kapoor wore a white and red saree where the first pallu was draped normally and the second one went around the neck like most of us drape a dupatta or scarf. Pant style saree drape is another way to drape a saree which is similar to dhoti style saree drape. I love the addition of the stunning necklace on that blouse and it was a good move to keep ears bare. sonam kapoor loves experimenting with her blouse designs and here she pairs an off-shoulder blouse with a cream saree. If you love wearing offshoulder then try it with ethnic wear too. 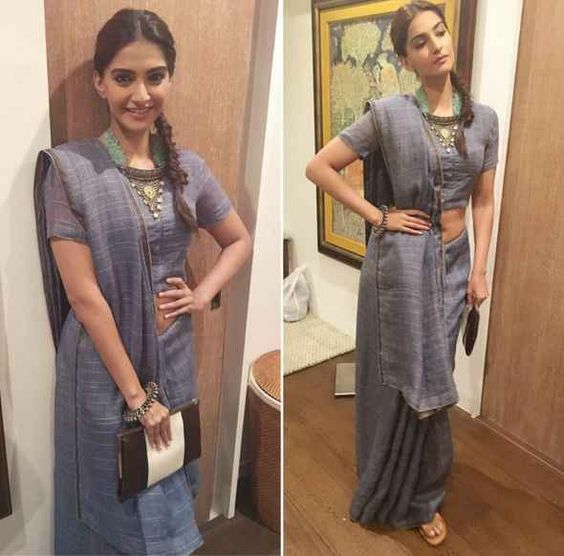 Dhoti style saree draping has become very popular these days and Sonam was one of the first few to spark off this trend. I love how she keeps the styling simple by adding just a statement neck piece too keep spotlight on the drape. The sheer cape trend is something I love and sonam gets full credit for popularising it. Here Sonam flaunts a shrug style sheer cape which she paired with delicate white saree. The hairstyle for this looks gives vintage vibes and I love the styling. Single shouldered blouse paired with a pale pink saree, Sonam grab a lot of eye balls. This unique Payal Singhal blouse has black floral embroidery and paired with a high puff hairdo it looked striking.. This traditional high on colour look is an instant favourite especially for winter weddings. The Abu Jaini Sandeep khosla saree paired with peplum style blouse can be worn by women who dont want to flaunt their not-so-flat belly. You can your existing peplum tops and pair it with a saree for this look. This dreamy dhoti drape Anamika khanna creation is one of my most favourite looks of Sonam Kapoor at Cannes film festival. The styling for this look is PERFECTION. Love the sheer cape, choker, makeup and hairstyle. 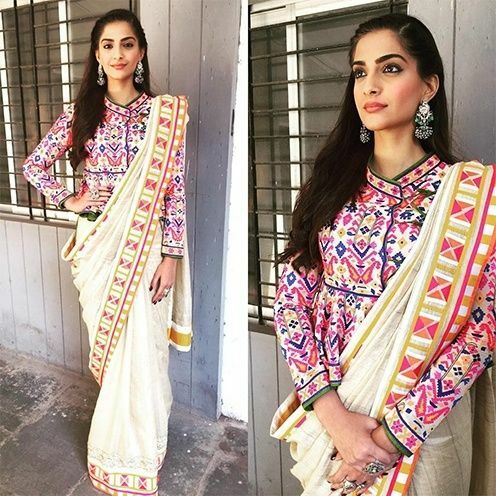 Sonam can do traditional saree looks with equal elan and this Kanjivaram silk saree look proves it. She paired this saree with elbow length sleeve blouse, jhumkas and hair bun. 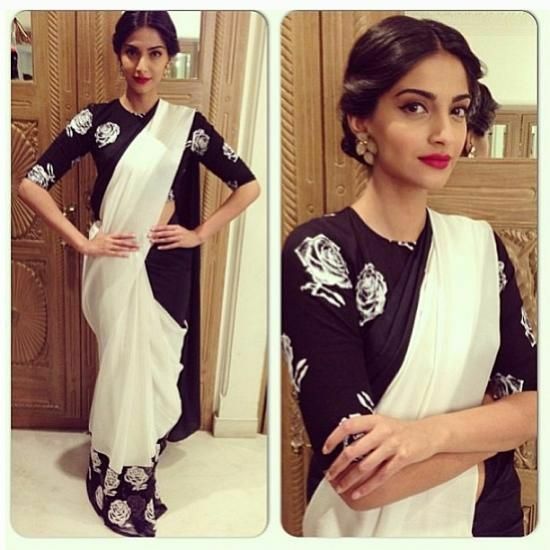 Cape style jackets with saree is a trend but sonam paired a jacket with Rahul Mishra saree. This look gives a very formal feel but if the jacket was more replaced with a vibrant print it can look super festive. I think this is interesting but I wouldn't try something like this? If you really want to wear white to a wedding wear it like Sonam kapoor does here. She wore this sequins and mirror work saree with a high neck blouse to Ahana deols wedding reception. Sonam looked royal and oozed elegance in a green organza saree whih she draped like a V in front. I love the jewellery she paired this saree with. Red and black is a classic combo and Sonam wore it for L’Oreal Paris Women’s Awards and looked every bit amazing in it. I particularly love the kohl rimmed eyes and soft lips in this look and the saree blouse is also something hatke. Love this dreamy blue saree look and the blouse it is paired with. This makes for a great winter festive look if you can handle two pallus. Attending an event for Grazia Sonam was spotted in a pastel floral saree which she paired with an embellished designer blouse. The hair bun, drop earrings and floral sari give this look a very retro feel. Shredded funky saree worn by sonam kapoor is super interesting. I love the styling here which makes the striking saree look elegant. The hairstyle, makeup and the gorgeous suhani Pittie earrings complement the saree nicely. For a saree like this the drape is spot on. Sonam wore a yellow and green chiffon saree with a green clutch. Upping the visual interest of this vibrant sunshine saree was the sheer embroidered blouse whih is very hatke and unique. Attending the Elie Saab Haute Couture Show in paris Sonam was spotted in a dreamy baby pink set saree which she paired with sleeveless high neck blouse and added a semi sheer cape jacket over it. I love everything about this look from the makeup to hairstyle to the colour. Also love the idea of pairing pearl earrings with pink saree. Which saree look of Sonam Kapoor do you like most?